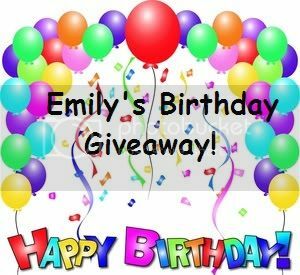 Falling For YA: Birthday Giveaway! My parents have made fun of me since I was a kid, that I celebrate my birthday the entire month of March. Well I'm embracing this as totally true and celebrating my birthday with all of you! I am giving away a book of your choosing from Amazon.com valued at $10! To enter just fill out the rafflecopter below. *This giveaway is US only, Sorry! On my b-day, I like to have me time to do whatever I feel like. Happy Birthday! I tend to eat as much cake as possible and relax. Go to the spa and get a massage!! Have a great dinner and movie! I like to just stay at home and celebrate with my family. Hi there! For my birthday I like to do....hmmmm. I am not really sure, maybe stay home and celebrate with a few friends and family and go out to a really nice restaurant! I like to take a day off from the kids! That's the best birthday present of all! On my birthday I like to take my closest friends out skating! Happy Birthday, Emily! :) I hope you have a great one! I generally like to read on my birthday- some nice uninterrupted time. Or, since my birthday is in the summer, I like to hang outside with friends! I love to take the day off and relax! Thanks for hosting this giveaway and happy birthday! I like to relax and eat cake and ice cream on my birthday. March is a fun month for birthday, unlike say April which is mine! Have a wonderful birthday and I hope you get tons of entries for your giveaway! On my birthday I like to have breakfast with my friends! On my birthday I like to cake and go to the bookstore. I like going out to dinner with my family. I like to go to the bookstore to pick out some new reads & then maybe watch a movie (my pick!) and hang out with family. i do love opening presents on my birthday, but the best part is spending it with my family and watching a movie with takeout food and CAKE. thanks again for this giveaway, Emily, and be mightily blessed! I like spending time with my family and friends! I love hanging out with my family and my two best friends in the entire world!! :) Happy Birthday!!! I love to order a cake..or pie, sweet potato pie! I love to go out to dinner with family and friends to celebrate and of course have cake =) Happy Birthday! I hope you have a great birthday! On my birthday I usually go out to dinner with my husband and then my parents take me out as well. I like to go to the beach on my birthday, but that's usually not possible because my birthday is in December, haha. Have a great birthday and thanks for the giveaway! I always take the day off and spend it with my dogs...usually going for a hike and then in the yard reading in the hammock. I like to go out and dance. Happy Birthday! Happy Birthday Month! I usually spend the day with my fam and my best friend and her fam. it's a blast! I also spend the day hoping I get books! I like to just read and relax :) And open presents! For my birthday we always go to my favorite Chinese restaurant that I've been going to since Preschool. I also get my favorite Baskin Robins cake cookies n cream ice cream with chocolate cake! Yummy! Of course presents and books are always nice to receive as well! :-) Happy Birthday! I like to celebrate for the week. Dinner with family then dinner with friends, spa day, shopping day. Cake everyday!! LOL!! I love b-days!! Thanks so much for this giveaway. I don't mind what I do on my birthday as long as I'm having awesome food, delicious cake, and am surrounded by friends and family I love. on my birthday i usually just hangout with my friends and family and eat cake like all day. I like to go out to dinner on my birthday. I look forward to eating a lot of cake. I like to treat myself to whatever I want. Books and more books for my birthday. And happy birthday to you, Emily! Happy Birthday Emily! I would like to go on a swimming resort with my famiely and friends. I just like to hang out with some friends. I'm not one for parties really! Eat! Parties (with cake) and then dinner out somewhere so I don't have to cook. I like to go to chuckie cheese with my daughter. I know it's my birthday but it makes me so happy to see her happy. I like to go out to dinner. And open presents of course! I like to shop and eat cake of course! I love splurging for myself and getting a maincure and pedicure. Our local spa gives 25% off any service in your birthday month so I do this once a year! Happy Birthday! Sit in the new Spring sun and read a great YA book, I think is the way to go! (With a beverage and snack, of course!) Enjoy! Happy birthday! Its nice to spend some time alone to relax and read then hang out with friends and family later in the day when its my birthday.